“I’m happiest when I’m in a yoga pose. Honest to God. My body feels, well, just magical. 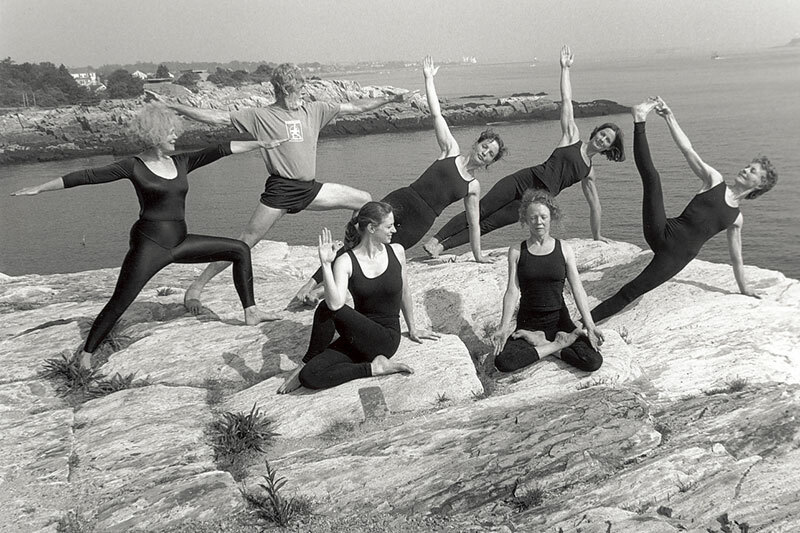 I could live in yoga poses,” Elaine McGillicuddy says while seated on the floor on her home. Tall and gracefully thin, she leans her 62 year-old frame over her legs in a forward bend. Her pale hands lay relaxed on the floor in front of her feet as she gently lowers her head to her shins, short salt-and-pepper hair concealing her face. “People see a picture of me in a yoga pose and they say “ouch.” But it’s not that way at all. It’s like, just bringing total circulation everywhere in your body. I see yoga as a lover, you know? Yoga’s my lover. In a sense.” Her voice is muffled by her legs. Behind her, a large, studded wooden cross hangs above an upright piano, upon which are two pictures. One is of her and her husband, smiling formally into the camera. 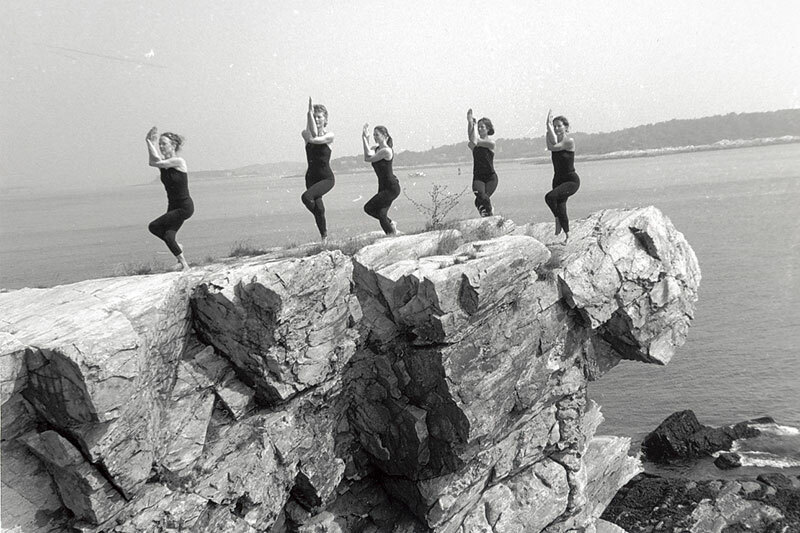 In the other, she and four other women stretch in various stages of yoga poses on rocky grass-covered shoreline of Maine. Elaine is a yoga teacher. 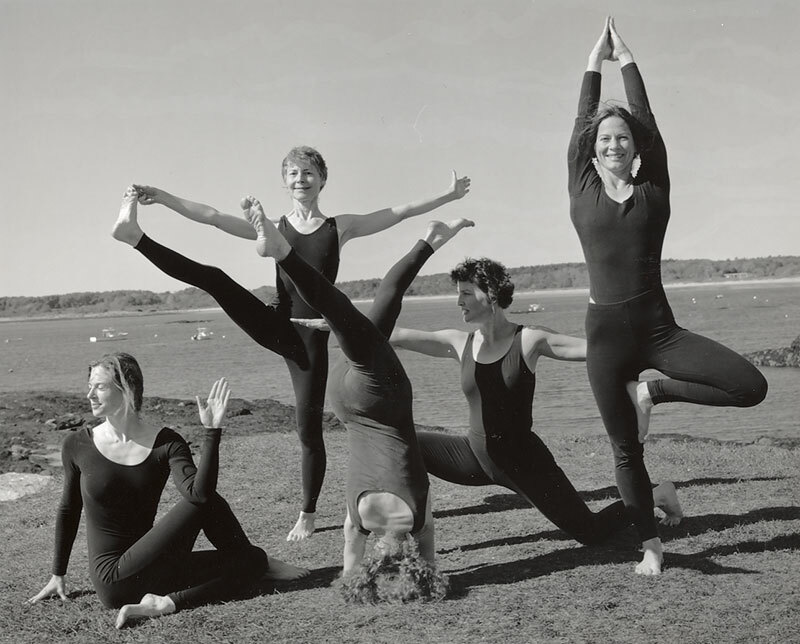 She is certified in the Iyengar Hatha yoga style, and has been studying it for over 20 years. Prior to yoga, she was a nun for 15 and a half years with the Ursuline Order. Now married, she met her husband, Francis McGillicuddy, in Waterville, when he was a priest and she a nun and Campus Minister at Colby College. Both left their ministries, in the wake of Vatican II, to be married. Currently, Elaine teaches at the Portland Yoga Studio, is involved in local peace groups, and teaches the Dances of Universal Peace. Elaine and Francis also take yoga and biblical studies to inmates in local prisons. “Somebody said, all we have to give other people is our experience,” Elaine says with a crinkled forehead and lighted eyes, referring to why she feels compelled to teach. “I mean, you can share knowledge, but that doesn’t touch the heart. That doesn’t pierce through to the heart the way one’s own experience does. I feel that after all these years, I do have a lot of experience, and I have learned a little bit about sharing my way. I like the idea of not being a model on a pedestal. I don’t want to do that. But sharing something about wisdom, or my journey, indirectly or directly – sometimes in yoga class I can do that more easily than if someone were teaching math or English. That’s what I like about the Dances and the yoga. I can bring in a spiritual dimension. Elaine teaches at the studio she founded in downtown Portland with Francis about eight years ago. From the third floor, the yoga studio looks out over Congress Street. Originally designed as a dance studio, it houses two formal practice spaces, two large closets and a bathroom. Narrow, clean-edged wood floorboards shine, reflecting the soft light radiating from two halogen lamps. The larger, inner room is where most of the classes are held. Two white pillars stretch strongly from the middle of the room, holding the whit, gilded-tile ceiling fifteen feet above the warm, hard floor. Two philodendrons adorn two windows that face the brick side of the building next door. Tuesday night intermediate class starts at 5:30. Elaine and Francis arrive a few minutes early to snap on the heater and the lights. A single strand of Christmas lights peeks out from an open closet where stacks of gray wool blankets, sticky mats and foam blocks await use. After taking off their shoes and coats, students file into the room and pick out props from the closet. They the line the walls, set up in relaxing poses and wait for class to start. Sun salutations are first in the series of poses tonight. Students take a deep breath in, raise their arms to the ceiling, breathe out and bend down at the hips to the floor. “20 digits in a row,” Elaine guides as hands and feet are placed next to each other, fingers and toes spread out and gripping the mat. Breathing in, taking the right foot back to lunge position, arms raise up: warrior pose. Atop her own stick mat in the front of the room, Elaine leads the class in the movements. Her arms stretch wide, her legs strong and firmly connected with the floor. The arches of her feet lift up as veins and bones lace towards her toes, which lift off the floor. Her uplifted chest holds her back straight and head steady. Breathing out, students bring their hands to the floor and take the left leg back for dog pose. Stretching heels into the wall behind, arms and legs shoot into the floor as strong as tree trunks, fingers and toes hugging the soil of the sticky mat. Bringing the right leg up in front they do warrior pose for the left side. Breathing in, both feet are brought back up front with hands on the floor. They breathe out in time with their movements. Finally, they breathe in, arms rise to the ceiling, then fall to their sides with the exhalation. Individual adjustments are made paying attention to the foundations: feet and hips should be strong but not tense. Stretching among the sounds of breathing and the floor creaking, Elaine calls out over the room, “Go to the edge of sweet resistance.” Shoulders are sturdy and firm, holding heads steady. Next, shoulder stands. Elaine demonstrates, showing the right way to do it, then the various wrong ways. Referring to B.K.S. Iyengar, the man who popularized hatha yoga in this century, and with whom she studies under in India, she guides students: “Mr. Iyengar says that one should be able to do shoulder stand for 8 minutes in order to do a head stand correctly and safely.” The sticky mat is placed horizontally against the wall, five blankets are folded in half and placed on top of each other and half the length of the mat, and the other half of the mat is folded over the blankets to provide a non-slip surface for the arms. The head lies back over the edge of the blankets, feet on the wall, hands hold the waist and lower back. Shoulders shift beneath the rest of the body. “Don’t move your head once you’re up there,” she advises. Advanced students can lift their feet from the wall and support them as they reach toward the ceiling. Some other students go ahead and do other poses that they’ve been working on. One student is an artist, and has been taking yoga for a few years. He likes to use the wall ropes to help stretch his shoulder and arm – he couldn’t raise them higher than his head before starting yoga. Now he’s gained greater flexibility, and uses the wall ropes every class night. He also uses the back bender that sits by the door. Shaped like a whale, its mahogany slats move in a graceful curve. Wooden bones support the back, hold the feet with a small resting ledge, and open the front of the boy, letting the head hang back, throat exposed. Lungs fill more deeply. Elaine keeps an attentive eye on her students while Francis does warrior poses on his own. Francis is a striking figure in his yoga outfit: brightly colored t-shirt and black shorts with elastic around the thighs. His hair is gray and black, long enough to fall a little from his forehead when he leans backwards. The gray beard that covers his face coupled with his bushy eyebrows almost hides his blue eyes when he smiles. His long legs span the entire length of the sticky mat during warrior poses. It’s not a far stretch to imagine him in black skirts and Roman collar smiling from the altar. Elaine continues her fluid movement around the room, constantly scooting in between students’ stations cluttered with extra blankets and blocks scattered on the floor. She slips her hand underneath their shoulders, lifting to form a concave space at the nape of the neck, a “ski slope” as she says. Exhaling appreciatively, students come out of their poses and stand up, kicking blankets aside. Elaine uses Francis as a model for the next pose, a supported back bend. He demonstrates while she makes points to the class. For this supported back bend, she expresses caution. “I don’t want you to force it, Dear,” wrinkles on her forehead writing concern for the recent pains he’d been having. Francis decides to try it and sets up in the middle of the room so everyone can see him. Lying back over a folding chair piled high with blankets, he closes his eyes. Padding around the room barefoot, Elaine closely observes everyone’s poses. “In every pose that you do, you don’t want to be in the middle of a rock and a hard place. You want to be able to wiggle around a little.” Raising arms over their heads, chests stretched wide by the force of leaning backwards, they settle into the pose. Several moments pass; Elaine assists students individually, putting more blankets under legs, checking to see if necks are supported. Looking up at the ornamental ceiling, Francis is still in the pose. His lanky arms hang loose while his long legs are tucked underneath. Elaine moves across the room to stand next to him, hands on her hips. He hasn’t moved since he lay back, not because he’s hurt, but because he likes it. Elaine bends down on her knees, ready to make a point to the class. “I went surfing one time, and I caught a wave and came all the way to the shore. It was exhilarating!” She chuckles quietly and happily, wrinkles forming around her mouth and eyes. “When your body says, ‘oh, you’re really getting a lot of fruit,’ stay longer. Smiling, Francis closes his eyes and remains. He has caught the wave. With twenty minutes of class left, Elaine and Francis turn down the halogen lights, and students lie flat on their blue and purple sticky mats. Some have a folded blanket for a small pillow, others place rolled up blankets underneath flared knees open like a butterfly’s wings. Elaine passes out rice bags, which students place over their eyes. This is savasana. Corpse pose. One is supposed to relax completely, ideally not falling asleep in the process. After checking everyone, Elaine moves to the middle of the room in between the two pillars with her water bottle. The room is quiet; movements few. Straight-backed and cross-legged, she sits. Last week, someone requested a song. She sang, “I am the Good Shepherd” in Aramaic, the language Jesus spoke. Tonight, she tells everyone to let their thoughts fall into a moving river. Taking a deep breath, she begins. It’s time to float. tighten up. If you look at a baby – a baby’s not tight. Right? A baby’s like a water balloon, which is what we all are. And as we get civilized, and society says, ‘don’t do this, don’t do that,’ we get hurt and tighten up and we kind of get in our little shell.” Demonstrating, Elaine curls up in a ball, arms wrapped tight around herself, legs pulled in tight. “We’re protecting ourselves, we’re creating a boundary so we won’t get hurt again. But then, the muscles get so tight it becomes a prison . . . so what yoga does, it begins to release that with the breathing and the letting go and then it affects you spiritually, too. You can still close down, but you have a choice. You’re not just stuck in that frozen, you know – that armor.” Unfolding herself, she straightens her back and continues. “Every now and then you see in the paper, although more in the past than now, that some people, fundamentalists, people will think that yoga’s pagan. It’s Hindu, or it’s suspect because it’s different. I think ignorance breeds that kind of narrow-mindedness. And as people are more educated or read a little more, she pauses, thinking. “They more broad-minded and are willing to try something else. They’re not just in a rut. I think it takes imagination to think of doing something besides aerobics. Elaine lowers herself to the floor of her living room. Legs placed wide apart, she stretches her heels away from her, the balls of her bare feet reaching toward the ceiling. She wears a Portland Yoga Studio 5-shirt, takes a swig of water from a 2-litre bottle and straightens her back. No matter where she is or what she’s doing, she is in a yoga pose. “Everyone is in some kind of posture.” Sometimes in church, kneeling on the kneeler during Mass, she leans back to stretch the hip socket that was injured so long ago. Born in 1935 to parents she describes as “self-made,” Elaine grew up in the small town of Springvale, Maine. She and her parents lived downtown in an apartment directly above their beauty parlor and dress shop. Both her parents were native French speakers, having immigrated to Maine from Canada. They taught their only child both French and English. “I was French-speaking from childhood. I’m very grateful that I lived at a time that Franco-American speaking children didn’t feel that they should hide their French.” Classes were taught bilingually at the Convent school where Elaine attended grade school. The Ursuline order nuns ran the school, and it is the same order that she joined not long after graduating from high school. As a child, Elaine used to go on the roof porch of the apartment where they lived and surrounded by flower pots, she would lie in the hammock and read. “I was an avid reader. I read so much my mother used to have to hide my books.” In between Sanford and Springvale, Elaine and her two cousins would play in the woods. At the time, it was said that a young French girl, Bernadette Soubirous, saw the Virgin Mary. She was later proclaimed a saint. “So as children,” she explains, “we were all filled with this and we would play seeing the Blessed Virgin in the woods by the Mousam River. “Vatican II happened in the ‘60’s.” She centers herself on her sitting bones, “there were rumbling, I think.” She pauses, remembering with bright eyes, “We used to do folk dances when I first entered. Then we got word from the Cardinals in Rome. The Congregation on Religious said no more folk dancing. So we’d get these messages from on high. Then I didn’t realize that we were run by a group of men in the Vatican,” she says, lifting her eyebrows in exasperation. Part of my reason for leaving was this thing that I didn’t understand. I felt called out the way I had felt called in. I used to be rather orthodox in my views before I studied theology. I used to think that God’s will was expressed through every word of the Pope.” She laughs heartily, “I’ve come a long way.” While in the convent, and continuing after she left, Elaine received her Master’s Degree in Religious Studies from Providence College. “One of the things that liberated my thinking was this study, where I saw there are all these schools of opinion . . . so I knew that now we’re overemphasizing the divinity of Christ, you know, too much. I found it liberating in a way. You know, it doesn’t reduce my faith. It’s more credible instead, and Jesus is more real. He doesn’t have to be this little Son of God walking around, and the more I read, the more liberated I am. As she told one of her students, “There’s no ‘should’ in yoga. You needn’t ask ‘where you should feel it.” The body is a mystery, a labyrinth.” Different bodies and experiences result in different reactions and results. She lifts her outstretched leg slightly, shifting in order to adjust the continuing stretch. She leans down slightly to feel the muscles lengthen, then brings her torso back, lifting her shoulders away from her ears. Elaine pauses to unfold her right leg. Bringing both legs straight out in front of her, she smoothes out the wrinkles in her purple leggings. Her hands run down her legs, her wide gold wedding band glinting in the sun. Raising her head, her eyes steady, she pulls her back straight and breathes a long breath. About the convent, “I was called in and I was called out. And it’s true. I know it’s true. I never regretted one second. My whole life has fallen into place. . . . I have strong intuitions about things. Entering the convent was that kind of decision, leaving the convent, marrying Francis, leaving my job at Thornton Academy, going into yoga, choosing the Dances of Universal Peace. Just strong, gut intuitions about things. . . . So my views have changed, but not my path. “Not as many to leave as there were,” Francis interjects with a chuckle. He crosses his legs and settles into the cushions. Leaning into the back of the couch, he moves his arm to rest behind Elaine. “It’s kind of exciting,” Elaine continues. The way that we got called out and here we are, among the laity. It’s going to have some kind of effect.” Many clergy who left still practice some sort of ministry, either in their parish or community. But officially, most are not recognized, paid or supported by the Catholic Church. “We’re like the transitional troops in a way. I really believe that married priests will be allowed to function in the Catholic Church in the future.” Elaine and Francis are still practicing Catholics, and Elaine is lector and cantor in their local parish. It’s been 28 years since Elaine left her ministry; 26 for Francis. Elaine looks over and smiles at him, referring to his years as a social worker after leaving the ministry. “And they always used to say that he’s a good listener. That’s his work – and some people call him Father McGillicuddy. “Yeah, they still call me that. Yeah, sure,” he says with a chuckle, crinkles around his eyes. “We were married later in life,” Elaine continues, “so we were more mature, and we’ve been blessed with – you know, chemically. We get along so well. You know what I mean. It’s a gift. In between running the yoga studio, doing the Dances of Universal Peace, and their involvement in peace movements, Elaine and Francis are certainly active. However, neither of the two considers they are “activists.” As a couple, they were an integral part of the War Tax Resistance movement in the ‘80’s. But since the studio became a reality, they haven’t had that much time to devote to the cause. They also belong to a peace group, Pax Christi, Peace of Christ, and a large group of married priests and their wives, CORPUS. “In a way we’re quietly active – quiet activists because it’s more like subverting,” Elaine says slowly, thinking out her words. “You know, like subverting the values of this culture that emphasizes material things and Rush Rush Rush. You know, teaching yoga you find your satisfaction within yourself, so you don’t need as many material things. “I’m so aware that there are different corners and you can make a turn in the path, or there’s a little side road,” Elaine says, her hands making paths in the air in front of her. “And there’s probably something there in the future that I have no idea about, because that’s what happened to me for yoga. So you never know. I have a feeling of anticipation that I don’t know. And the not knowing is the best part of it. Because I figure that it’s an evolution. “If I’m called, I’m called,” she says emphatically, “and I know that there’s so much joy in following what you’re called to do. You know, as Jesus said: ‘Whoever will lose his life will find it.’ And I’ve experienced how when you feel called to something you hate, you go kicking and screaming, there’s so much grace with what you’re called to do, it will pull you through anyway. But I think yoga is my path. Their Volkswagen with “St. Peter was a Married Priest, Too” sticker slapped on its bumper pulls into the parking lot of the Cumberland County Jail. Walking into the entrance flanked by cement pillars, they juggle arm loads of sticky mats and bags filled with belts. Just the day before, they offered a class on the Dances and yoga to a group of giggling high school students, following upon a request by a history teacher friend of theirs. Every other week, Elaine and Francis are here offering yoga to any inmate who wants it. Alternating between Cumberland County jail and Windham Correctional Facility every week, Elaine considers this their jail ministry. After being checked over by a guard with a metal detector, they head deep inside, through many corridors separated by loudly locking steel doors. The walls are painted a pale, dusty green, and the air smells like chlorine and disinfectant. In one long corridor, windows blocked by thick gray bars peek out to a snow-covered garden surrounded by 15 foot brick walls. Inside pod C2B, three male inmates are intrigued enough by the idea of yoga that they follow Elaine and Francis into the small classroom, and take off their orange slip-on shoes and socks. After moving two wood tables aside, Francis lays out sticky mats and then Elaine talks the men through a handstand. They place their hands on the floor, fingers pointing three inches away from the wall. Kicking one leg up, then the other, they try to balance on their hands. She nudges one man’s legs towards the wall. Middle-aged, his face reddens as he repeats her instructions, disbelief and effort in his voice, “Higher with the feet.” His hands press into the mat, knuckles whitening around his gold wedding band. Francis chuckles and the men do too. They find that their orange cotton pant suits are quite loose enough to accommodate their lunges, but they lean against the wall for support and reach their arms away from their bodies for warrior pose, imitating Francis. A mass of other inmates crowds around the glass door, looking in and commenting on the progress inside, voices muffled by the thickness of the glass. “I already feel it!” he says with a smile. The man smiles and adjusts the books Elaine has given him. “Oh, great. Thank you, Francis,” he says with a little laugh in his deep voice. completely. After this, she tells them to let go and “hug themselves” to stretch out their shoulders. “Trying to,” he says as he adjusts his legs. “Well,” she replies. “You know you can write to me and ask me.” After thinking, she says, she’ll mail them pictures of poses for them to follow. A short 40 minutes later, after back twists on the floor and variations of warrior pose, it’s almost time to leave. The men outside the door are still there and watch as Elaine sets up for savasana. She snaps off one of the fluorescent lights and has the men rest their calves up on the beige plastic chairs in the room. She tenderly places a belt over each one’s eyes to block out the light, folding the belts twice so they overlap. Moments of silence pass. Talking and television from outside the classroom are barely audible as the men in the classroom relax. The skin on their faces loosens; wrinkles around their eyes soften. It’s now time to leave. Guards are rolling supper carts down the corridor towards the pod. Elaine’s face opens with a wide grin, eyes shining. Francis is beaming. 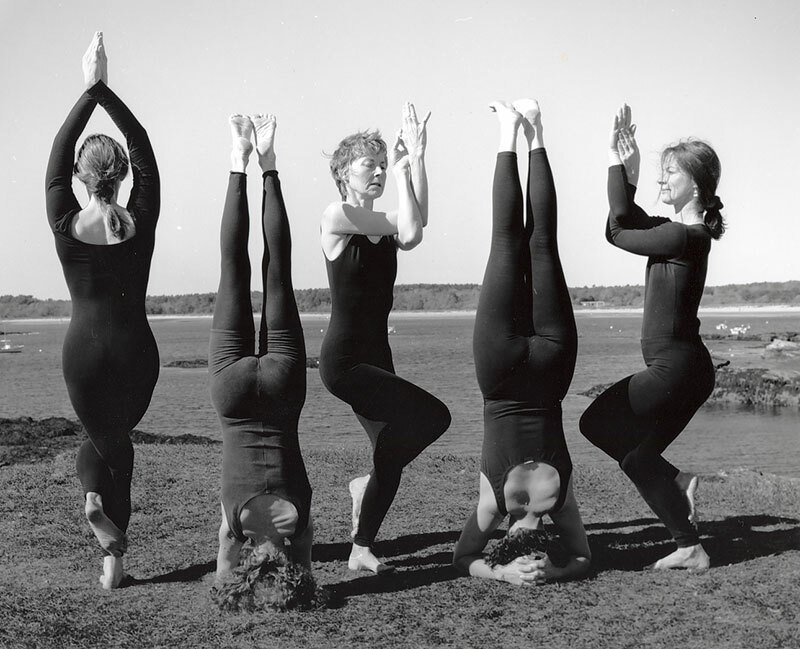 Bill Gillis took these five photos of Portland Yoga Studio’s teachers doing yoga by the sea.